But it's not basic income, an expert says. Gavin Newsom, the new governor of California, has big plans to revamp the state’s poverty-prevention tax credit program so that it helps more people who are struggling to make ends meet. Currently, the federal Earned Income Tax Credit (EITC) boosts the annual tax refund to households making less than $45,802. 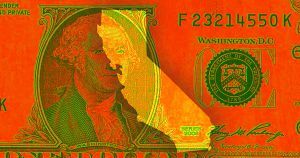 The state version in California, the California Earned Income Tax Credit (CalEITC) adds an extra refund for those making less than $22,000 per year. The new plan would more than double CalEITC’s funding so that 400,000 more low-income families can receive assistance on a monthly instead of an annual basis, according to Fast Company — but Adam Ruben, the campaigns director of the Economic Security Project cautions against calling it basic income. To Ruben’s point, a monthly payment for families in need sounds a lot like universal basic income, a system that’s often touted as a solution — or at least a bandage — for wealth inequality. But both the current CalEITC and Newsom’s proposed expansion of the program will only go towards low-income, working Californians. “What we’re seeing is the idea of the importance of a steady drumbeat of financial security throughout the year,” Ruben told Fast Company. The tax credit serves more as an acknowledgment that many jobs, even when paying out a $15 minimum wage, don’t provide enough for families to make ends meet or escape from debt. Rather than helping everyone, the expanded CalEITC would focus on helping those who don’t make enough or can’t get enough shifts to get the extra help that they need, Fast Company reports. By switching to a monthly payout, families receiving assistance would be able to better manage their finances than under the current system, under which they have to stretch out one payment over an entire year. Under Newsom’s proposed expansion, the budget for CalEITC would jump from $400 million to $1 billion. This would let California raise the program’s income cap to $30,000 a year — an increase that means 400,000 more households would become eligible for benefits. Presently, CalEITC provides families with $2,879 per year. The expanded version would reportedly more than double that payout, with an additional $500 given to families with young children. For now, the proposal is in its early stages, so the specific payment plan has not yet been released. But the extra $600 million will likely come from increased corporate taxes or income taxes for the wealthiest Californians, according to Fast Company. Editor’s Note 1/17 at 10:30 AM ET: This article originally claimed that the new CalEITC proposal would extend payments to any Californian regardless of immigration status. It also misspelled Adam Ruben’s name. It has since been corrected.